The DPC 3-1 Digital Input Card allows for conversion of a single universal input channel to accept up to three voltage free contacts. The DPC-3 Series Card has been designed for the Invensys Network 8000. Software loadables for these Input Cards are available on the Invensys BBS. The DPC 3-2 Digital Input Card allows for conversion of a single universal input channel to accept up to three voltage free contacts of any mixture such as mercury wetted, Triac, etc., which may have inherently large and varying resistances. The DPC 3-2 Cards on-board circuitry allows the Microzone inputs to have a consistent input reading, unaffected by long lead lengths, varying resistances, etc. The HOA-2 Digital Output Override card has two channels. These cards allow for manual override switching of a controller’s output channel. The card was designed for the Barber Colman Network 8000 Microzone II Controller but may be applied to any controller via interposing terminals. The HOA-2 allows an operator to manually select On-Off-Auto positions for a particular piece of equipment. Monitoring of its own override status is an added feature. Terminals OVR and OVR provide a normally closed contact which opens when any switch is placed out of the Auto position. 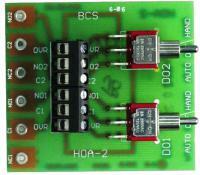 The HOA-4 Digital Output Override card has four channels. These cards allow for manual override switching of a controller’s output channel. The card was designed for the Barber Colman Network 8000 Microzone II Controller but may be applied to any controller via interposing terminals. The HOA-4 allows an operator to manually select On-Off-Auto positions for a particular piece of equipment. Monitoring of its own override status is an added feature. Terminals OVR and OVR provide a normally closed contact which opens when any switch is placed out of the Auto position. The DPC-5-1 Digital Input Card allows for conversion of a single universal input channel to accept up to five (5) voltage free contacts such as relay contacts, auxiliary starter contacts, differential pressure switches, etc. which may have low and fixed resistances. The DPC-5 Series Card has been specifically designed for the Invensys I/A Series. These new cards are designed and compatible with the DUI expander object available in all I/A Series Controllers (Rev 3.0 or greater firmware required). Each DPC-5-2 Card allows for conversion of a single universal input channel to accept up to five (5) voltage free contacts of any mixture such as mercury wetted, Triac, etc., which may have inherently large and varying resistances. The DPC-5-2 Card’s on-board circuitry allows the controller inputs to have a consistent input reading, unaffected by long lead lengths, varying resistances, etc. DPC-5-2 utilizes the five volt (5V) DC supply found on board the NW 8000 Microzone and I/A Series 800 Series controllers. Each DUIC-5P Card allows for conversion of a single universal input channel to accept up to five (5) voltage free contacts such as relay contacts, auxiliary starter contacts, differential pressure switches, etc. which may have low and fixed resistances or any mixture such as mercury wetted, Triac, etc., which may have inherently large and varying resistances. The DUIC-5P Card’s on-board circuitry allows the controller inputs to have a consistent input reading, unaffected by long lead lengths, varying resistances, etc. The DUIC-5P card utilizes an on-board power supply that allows five volt (5V) DC supply or twenty four volt (24V) AC supply for maximum compatibility. An LED indicating power is included on the card, as well as a jumper that, when shorted, inserts the 22.1k Ohm resistor required for UI Contacts on an MNL-800 card. 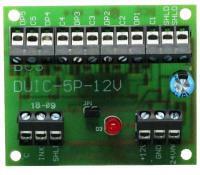 The DUIC-5P Card has been specifically designed for the Invensys I/A Series controllers. These new cards are designed and compatible with the DUI expander object available in I/A Series Controllers (Rev 3.0 or greater firmware required). The HOA-3 Digital Output Override card has three channels. These cards allow for manual override switching of a controller’s output. The HOA-4 Digital Output Override card has four channels. These cards allow for manual override switching of a controller’s output. The 24V-2CH and 120V-2CH boards have 2 output channels. These boards allow for distribution of power connections. 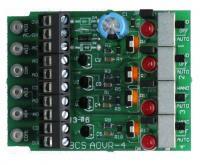 The 24V-5CH board has 5 output channels. These boards allow for distribution of power connections. The IORET-33 board has 33 internally connected terminals. These boards allow for convenient location of return, common, or ground wiring in a panel. Copyright ©2019 Smartware Technologies. All Rights Reserved.